Finally after years of research, hard work and determination, the ROV team of Sub Sea Research retrieved actual footage of the Port Nicholson. It was an exhilarating moment for the entire crew as they watched the camera span across the side of the ship outlining the letters that made up her name. As excited as we all were, it felt bittersweet. Though we had worked hard and sacrificed a lot to get to that point, we also knew the reality of the tragedy that fell upon her and the crew that fateful day over 60 years ago. The Port Nicholson was a British cargo ship that was completed on 5/3/1919. Her home port was London. She originally made sailings between the United Kingdom, Australia and New Zealand. During the time before she sank she was involved in a few accidents. She ran aground once, had two separate fires aboard, and actually had a collision with a tugboat, (the Ocean Cook) that eventually sank and caused the death of four lives. On her final voyage in 1942, the Port Nicholson left Halifax bound for Wellington with a stop off in New York. At that time, she was part of a convoy which included four other ships being escorted by six military ships that ran between Halifax Harbour and Boston. According to the Naval Records, during a trip on “The Triangle Run” the convoy was being tracked by a German U-Boat (U-87). It was the evening of June 15 when two ships in the convoy were torpedoed. One was the Port Nicholson and the other was the U.S. troop ship “Cherokee”. The Port Nicholson was hit twice; one in the engine room that resulted in two deaths and the other hit the stern. She was under the command of Capt. Harold Charles Jeffrey and was said to be carrying a cargo of 1,600 tons of auto parts and 4,000 tons of military supplies. There were eighty-three survivors from the Port Nicholson and twelve from the Cherokee. The “Nanaimo” picked up seventy-nine of the eighty-three survivors from the Port Nicholson. Nanaimo remained with the Port Nicholson throughout the night as she didn’t immediately sink. The following morning a sea boat was sent from the Nanaimo with Capt. Jeffrey, his chief engineer, Lt. John Wakley, and three ratings. The men boarded the Port Nicholson to see if she could be salvaged. It wasn’t long before strong gale winds picked up and she started to sink. The men hurried below and climbed aboard a life raft but the suction of the sinking boat overturned theirs. 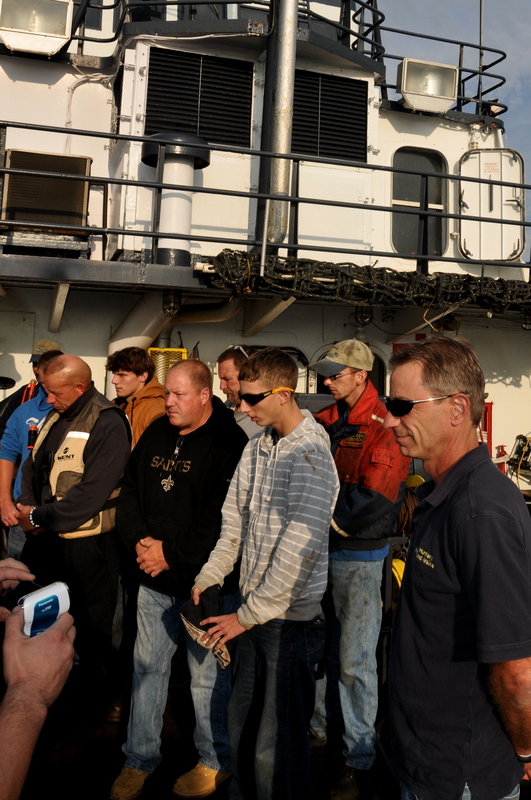 All perished except two of the crewmen which were picked up by the Nanaimo and taken into Boston. “It is told in the Bible that once the Lord was in the fisherman’s boat and a great storm came upon them, and the fishermen feared they would drown. The Lord said to them, have faith in Me. And thus it was they had the faith to survive. This same situation was and is repeated each day at sea. No man has ever served at sea without knowing that each day could be his last and no one would even know where at sea he lay. No man served a day at sea without the knowledge that the ship he sailed might not survive to sail another day. But no man at sea let these fears overcome him. He knew his shipmates were beside him to help stand the watch, to plot the course, and to be the family and support we all need to meet and survive another day. They were his shipmates. As each day ended, men at sea counted their blessings of a day well done, and to mark the end of their watch, they would toll the bell, the eternal mark of the passing of time at sea. 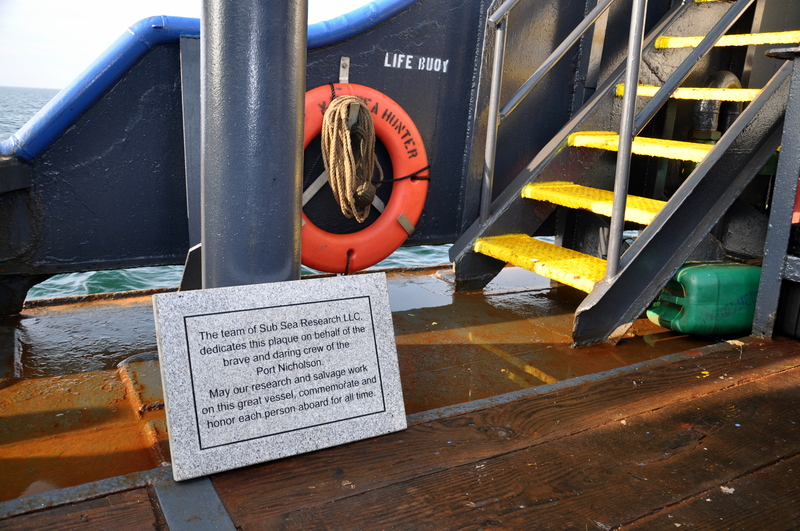 We honor the men of the Port Nicholson as we toll the bell to mark the end of their final watch. Well done men, well done. It was a great voyage, and you served your watch. We are proud to know you through our quest. My grandfather John Fox was one of the surviving crew members of the Port Nicholson when she was sunk by the German U Boat. He was a stoker in the engine room so was lucky to survive. My mother (his daughter) has the original newspaper clipping from when the Port Nicholson went down. Interesting to hear the stories about her and what she may have been carrying. Cindy, Very touching tribute to those lost at sea when the Port Nicholson went down along with the Cherokee. Thank you Bill, It really was a beautiful day, the ocean was calm and it seemed extra bright. The plaque was such a nice tribute and now will rest alongside the PN.